As you may have already known, Friendster will delete all photos, blogs, messages, comments, testimonials, groups and account profile on May 31, 2011. Friendster is shifting from social networking site to social entertainment site that focuses more on games and music. They will be improving their features and at the same time removing social networking features. However, your Friendster account, list of friends, games and basic profile and login information will be retained. That being said, you have until May 31, 2011 to export your Friendster profile information by logging in to Friendster and use the Friendster Exporter application. I tried to Export my Photos to Flickr, but it doesnt work, it says “Application should be running inside the canvas page“, but it is! Or maybe because I am only using the Free version of Flickr? So I just downloaded everything in my computer. Here’s the download notification I got from them when I used the export app. 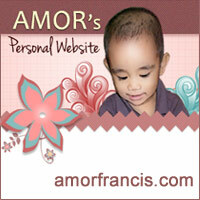 Here’s my downloaded Friendster profile. Complete with links to Photos, Comments, Shoutouts, Groups and Messages. 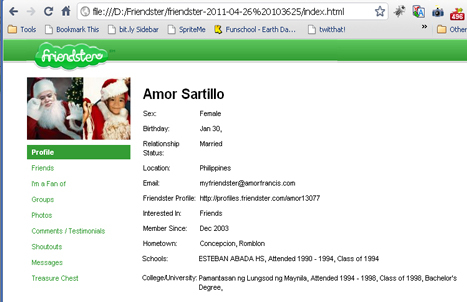 I joined Friendster in December 2003. Reunited with my long lost friends and classmates because of Friendster. I even had a customized profile page. After moving to Facebook in 2009, and having been addicted to it, I hardly visited Friendster. Look at that profile pic, it was uploaded December 2008, if my ‘failing’ memory serves me right. 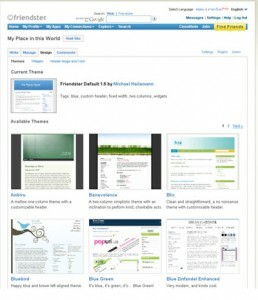 Now, I’m wondering what Friendster will look like come June 1, 2011.
via Social Network Pioneer Friendster To Erase All User Photos, Blogs And More On May 31. Yay! I can&apos;t remember when I deleted my friendster account, kasi may bayrus warning palagi no&apos;n. Nakita siguro ng friendster na di nila kayang tapatan ang facebook kaya babaguhin nila&apos;ng concept nila. It&apos;s about time to change for a change. You deleted your Friendster account pala. I didn&apos;t, although hindi ko na rin binibisita eversince nag FB. Once in a blue moon lang. But I have other friends who deleted their accounts din. Who would have thought magbababu ang Friendster. Eh ang FB kaya, hmmm, malabo pa.
Ako rin, helpful naman yung export as in masi-save nya lahat ng info from pics to testimonials to messages. You just have to wait for a couple of minutes lalo na kung maraming pictures. Thanks for this information. Now ko lang nakita. Download ko na nga profile ko! 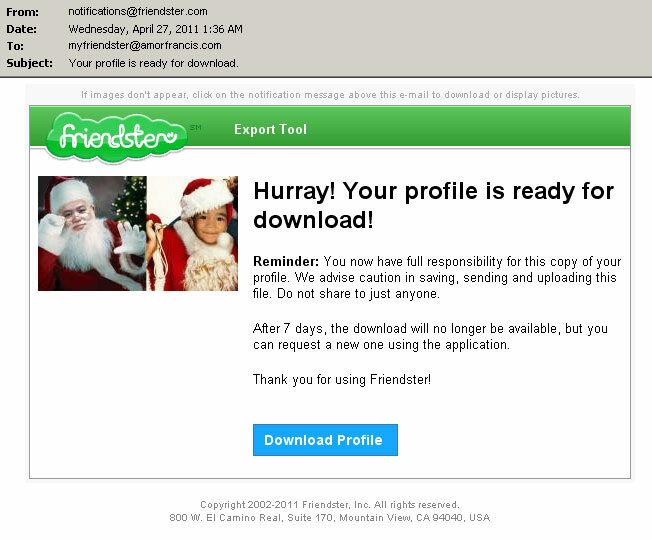 i&apos;m so damn late… i can&apos;t export my friendster files! arggg!! !